People frequently ask me what I do to keep my orchids so healthy. Repotting is one of my secrets of success. There comes a time in the life of any organism when you are so root bound that you either have to clean out your environment, move out to a new location or both. 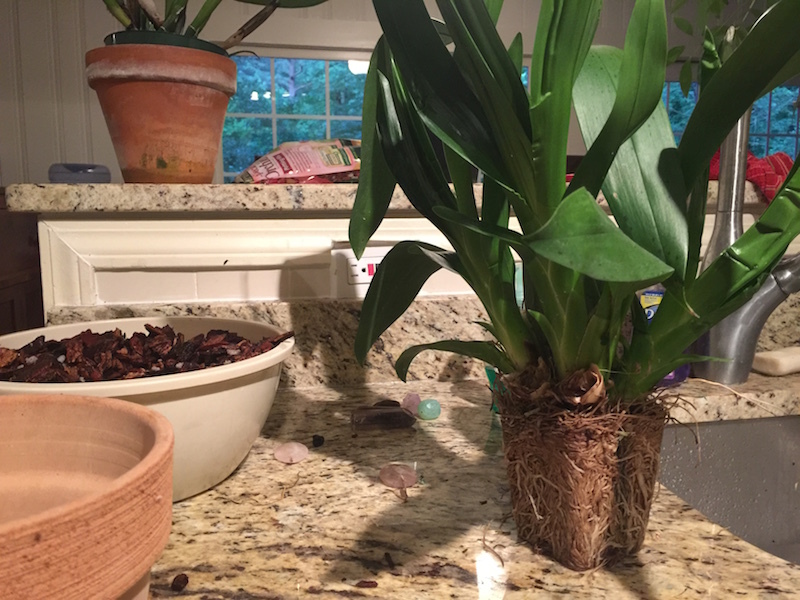 You can think of the process of repotting an orchid as both A cleaning out the environment and B moving. 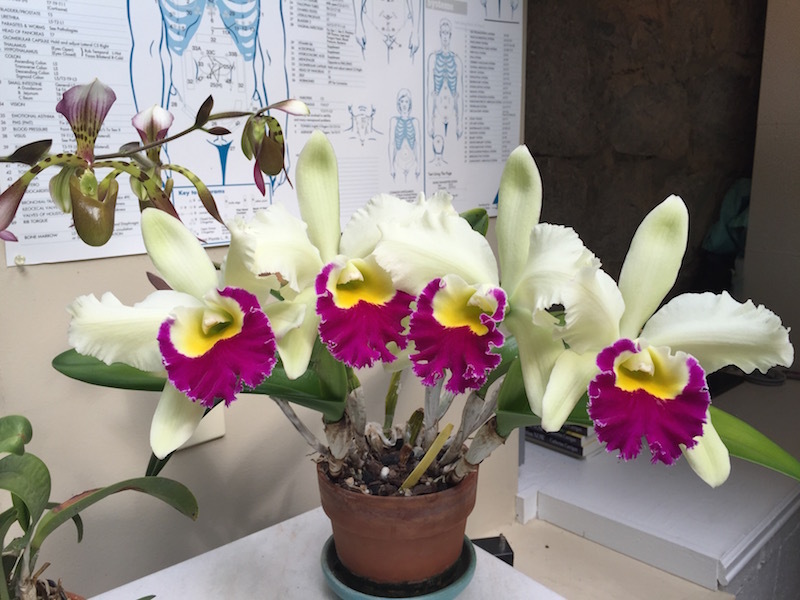 By putting yourself and/or an orchid in an entirely new, clean environment, you can suddenly find yourself being nourished anew by your surroundings. How do you know if you are root bound? If you feel like you have tapped out every single resource in your current living situation, you’re root bound. If you have run out of room to grow, you’re root bound. If you’ve stopped blooming, you’re root bound. If you look tired all the time, you’re root bound. If you actually want to grow bigger and better but can’t seem to make any progress, you’re root bound. Here’s what a root bound orchid looks like. You can see that he has grown to the limit of his former pot. Even if you are not an orchid expert you can tell he would need to be repotted in order to make significant improvement. I’m not a professional orchid grower. I don’t display my orchids at gardening shows. I just admit that I’m obsessed enough and in love enough that I will do whatever it takes for my orchids to be very happy. I bought high quality orchid mix. In this case, I bought Sun Bulb Better Gro Special Orchid Mix, 4-Quart, which you can read about at this link. I bought two new orchid pots with vents on the side to allow the roots to breathe. The ones I got were from Hirts Pots. You can see them at this link. I repotted a total of four orchids yesterday. For two larger cattelyas, I simply washed out and reused two old large clay pots. I soaked the bag of orchid mix in water for one day before repotting. I poured about 3 cups of water into the 4-Quart bag of potting mix and sealed it up to allow the moisture to build. This is a secret I learned from a professional grower. You don’t want to repot your orchid into dry mix – you want his new home to be perfect the second he moves in. 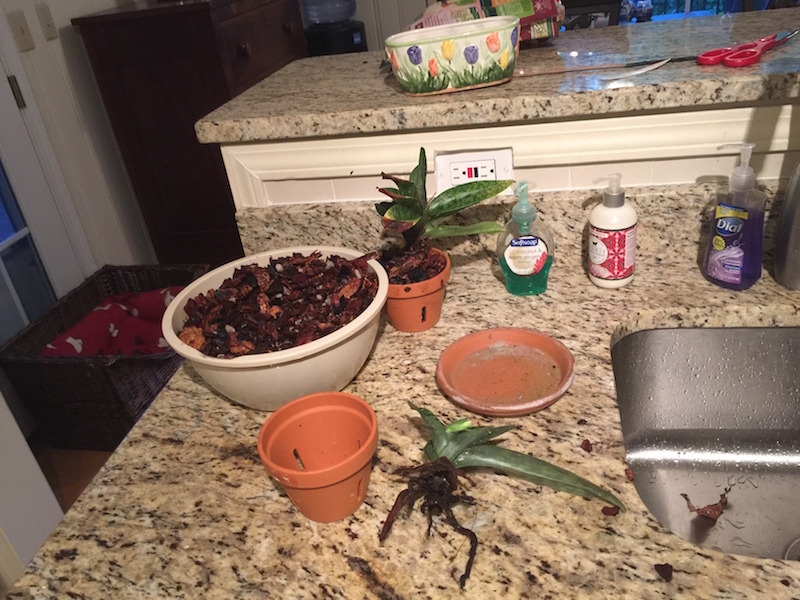 I cut off the dead roots at the end of the existing pot and pulled each orchid out one at a time. I collected all the old potting material. The orchid would have pulled most of the major nutrients out of this mixture already. I threw the old potting material into my compost pile. Everybody should have a compost pile in their yard because it’s natural recycling. After cleaning off the roots of each plant, I put fresh wet potting mix in the bottom of a new clay pot. I put the orchid in the pot and gently surrounded it with the fresh wet potting mix. I then went down to my studio and even found a slightly different living arrangement for my newly repotted orchids. Later on, when it’s time to water again, I will fertilize them with a combination of 20-10-20 orchid food, such as this one, and one drop of Superthrive Vitamin Solution mixed in a gallon jug of water. Last year, I had the blessing of repotting myself not just once but twice. Just like with my orchids, I’m not a Feng shui expert, I’m just obsessed enough and committed to my own growth enough that I’m willing to do whatever it takes to thrive on all levels. I moved to a new home in Florida, only to recognize after about six months that I did not want to A live in that community or B marry my fiancé. During this process, I got rid of so much stuff! I took countless carloads of old belongings to Goodwill not just in Atlanta but also down in Florida when I recognized there was even more claptrap that no longer served me. I sent innumerable boxes of old clothes to a very close friend in Maryland who happens to be my size. In December, I moved back to my beautiful home in Atlanta. By that point, everything that could have been cleaned had been vacuumed, dusted, washed, polished and disinfected not just once but multiple times. Everything broken had been fixed. Even my kitchen had been refurbished. When I came back to Atlanta, my dear friend and Feng shui master friend Katherine Graham created a whole new floor plan for my home. I’m a raving fan of Feng shui and the best Feng shui master I’ve ever worked with is Katherine Graham, so if you’re serious about living in the best possible environment run don’t walk to Katherine Graham. In Feng shui, they say that if you want to change your life, change 27 things in your environment. Not only did Katherine help me create a new floor plan, I put down new rugs, bought a new bed, got new porch furniture, set up a new yoga and meditation room for myself, hung the covers of my four recent Amazon No. 1 bestselling books behind my new desk and generally totally and completely refreshed my environment. My friend and long-term client Charlenne Carl lent her expert interior decorating skills to the process and was kind enough to give me new lamps and lampshades and hung my pictures like a pro. I used sage to clear stagnant chi and Katherine Graham even organized a party earlier this month to bless my home and bring in love and joy. All the old energy is gone. I feel revitalized, joyful and am in the process of starting a second business. Just like the orchids, we humans can greatly benefit from repotting. Here’s what my chartreuse orchid looks like after it has been successfully repotted. If you think cleaning out is painful, try stagnation. Give yourself permission to repot your orchids and yourself and see just how beautiful your life can be! Thanks for reminding us our plant partners have a lot to teach us ( repotting, lying dormant, flowering…). I have also just gone through that sometimes dreaded “repotting”. I am very happy I did, but at first it felt like a failure of the old life/pot. Of course that wasn’t the true nature of the process. The old potting soil is rejuvenated-the old pot would hold new life. The truth is, that old pot nurtured me well and I grew full in it. Tom P.
Hi Tom, Thank you so much for taking your time to read my blog! Yes, at first we sometimes view life changes as “failures.” If we simply renamed them “repotting,” it might be much easier for us to understand how necessary these changes actually are! If we could see ourselves the way I photographed the root bound orchid, we might be racing ahead to save ourselves rather than dragging reluctantly through the oh-so necessary life-affirming self-saving changes we must occasionally do. Hi – someone just gifted me with an Isochilus Major orchid in a 4″ plastic pot. the ‘branches’ are about 2 feet long and plentiful. how do I know when/if should be repotted? I am tempted to do it soon as the pot is one of those solid greenish-colored pots with just the drain holes on the corners at the bottom. but i’ve only had Phalens in my life, so i’m stumped! thanks for any help! !